Gifts from the Pirates: "Odin wept! Not... wait for it... the Santum Sanctorum! " "Odin wept! Not... wait for it... the Santum Sanctorum! " It's been a while since i started my Super Hero Squad collection and has been 5 months since my first blog post about them "you were expecting maybe squirrel girl". I thought it was about time i had an update on what i have collected since. The 2 Thor boxes above came this morning (hence the kick up the bum to write the post). My better half is truly amazing, a few weeks back she won me these 4 hulk sets on ebay for 99p i couldn't believe it when she told me as i had seen the Thing/She Hulk box go for a fair bit on more than one occasion. I had been after Shocker and Shock Proof Spider-man For a While so was chuffed when i won them on ebay and was even more pleased when i noticed the seller was also selling the Scarlet Witch. Most of these figures where released years ago so its a pain trying to find them all brand new so id say half of my collection are loose figures brought from here and there. It gives me loads if satisfaction finding the figures i don't have for my collection (especially when their found in a charity shop or other random clearance shops). Mrs M's favourite of the collection so far is The Blob "he's really cute" she said. I think she has a bit of a soft spot for us boys with extra weight. Worked out well for me though!! 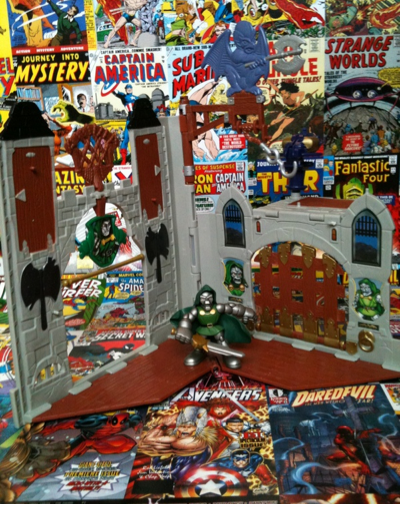 Ive had the Dr. Doom play set for a while,it should have been included in my first post but i completely forgot i had it. Happens quite a lot in our house as there are toys everywhere packed away. ( while tidying up after taking these photo's i found a collection of Bucky o Hare toys i forgot i had which im sure will be on here very soon). My youngest Opeie has been having a play with them as they have come through the post but they are all going into storage until he is older. Our eldest Seth doesn't even know their in the house, he seems more interested in Star wars and Batman at the moment. Im sure there will be a 3rd part to this collection very soon as i am always on the look out for more,as well as trying to complete many other collections. (I cant wait till we move and we have a loft). "It's a place to hang our cowls"
"Doth thou mother know you weareth her drapes?"